I gotta tell you I’m so glad it is Friday. Do I say that every week? I sure feel like I do. Anywho I feel like I have several random things to write about so I’m just going to jam them all into one post. Very hot showers – the hot water relieves the itch for a few hours. I used those methods all last weekend and earlier this week. Now I’m pretty much just using tons of oatmeal lotion to help relieve the itch and very dry skin. I also think I have located the culprit poison ivy plant in the backyard. I’ll have to see about removing it or killing it soon. But I’m scared to go near it! 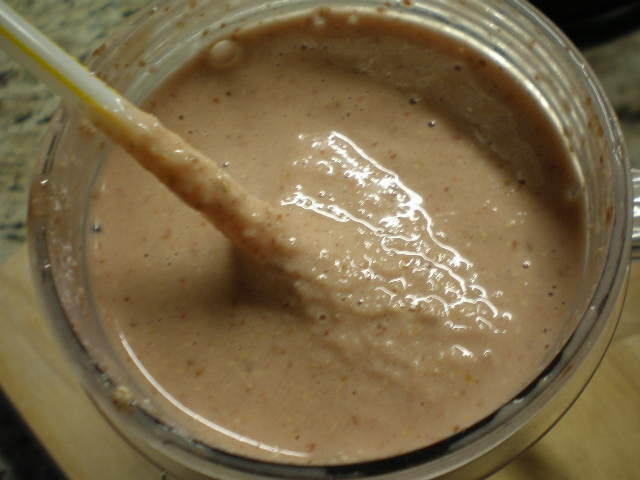 Blend with whatever kitchen apparatus you want. 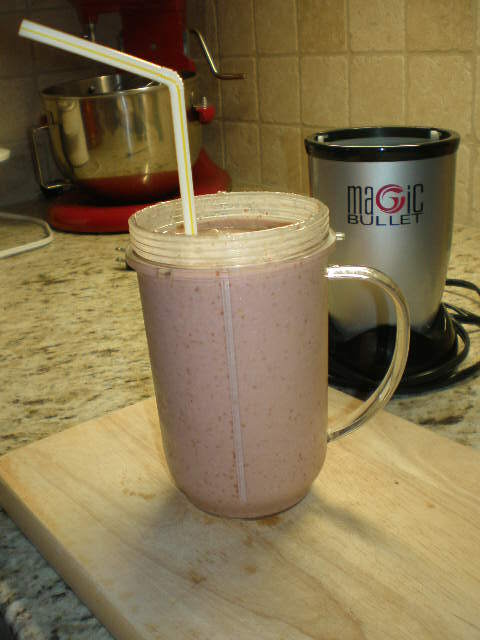 I use the Magic Bullet. I wish I had one NOW! Ok third topic is farmers’ markets. Yesterday my office had a little farmer market in our very own cafeteria! Can you believe that? What an excellent idea! One local farmer came and set up several tables of all organic produce for people to peruse during lunch. Of course I happily bounded down to the cafeteria, bag in hand, to check it out. 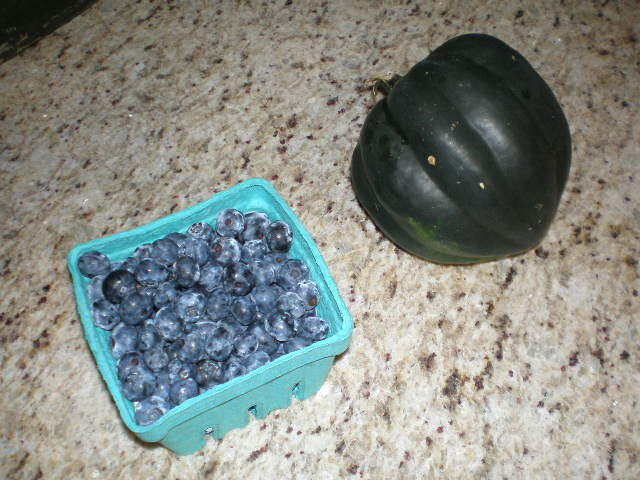 I ended up buying a pint of blueberries ($4), one acorn squash ($2) and 4 ears of corn ($2 – not pictured). This is a very early acorn squash so the farmer said it should be very sweet. I can’t wait to eat it. I haven’t had acorn squash since last fall when we ate the last of the ones I grew in my garden last year. I like to roast it in the oven with a maple-orange-cranberry glaze. MMM. The farmer guy said they will be back to our office every Thursday for awhile. I’m super pumped about this. I hope it encourages more people in the office to buy local and support our farmers. How much more convenient can it get than this? 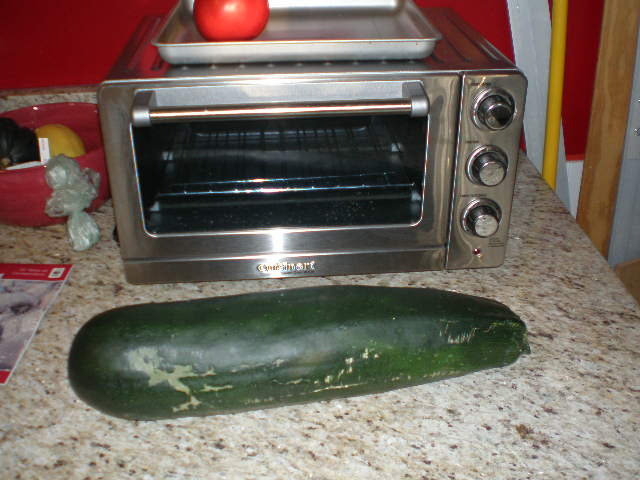 The zucchini is larger than the toaster oven! What am I going to do with this thing? 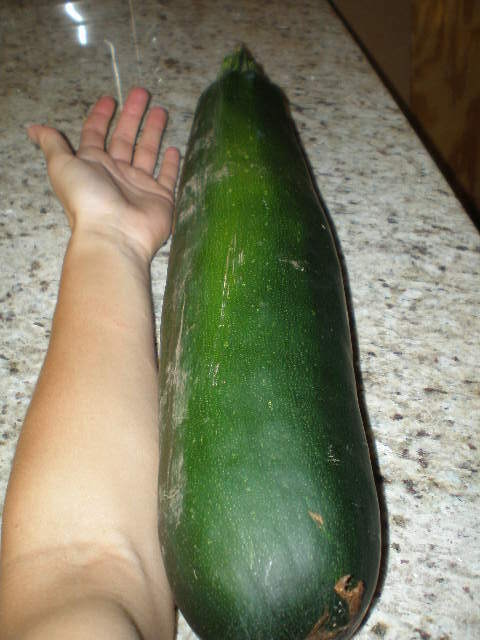 I really want to make chocolate zucchini muffins, but that will only use up like 1/8 of this monster. I’ll have to think of something else too. Fifth topic is running. I finally went running last night after work. Before that I had not been on a run since June 10th. Well over a month! Last night’s run may or may not have been smart since it was about 95 degrees F outside. I took it slow and ended up walking part of the way back to the house. Even with the heat it felt good to get out there and move my body. I’ve been quite the lazy bum since we got back from Hawaii. See earlier this week I ran into my coworker/friend in the cafeteria who told me she’s doing the KC half-marathon in October. So that got me thinking that I really want to run it too. I want to try to break 2 hours. My current personal best is 2:01. I know I can run under 2 hours. The race is 12 weeks from Saturday so I have just the right amount of time to train. I think that’s about it for Random Posting Friday. I’m off to lunch with a good friend I haven’t seen in forever. I hope everyone has a fantastic weekend!!! Ooh, that smoothie looks delicious! I am going to the farmers market tomorrow!! Can’t wait! Poison ivy sounds hellacious. I’m glad you’re on the mend! I have a couple friends running that half! I was going to but then I got pregnant and it’s only a couple weeks after my due date so it’s not gonna work out. haha. It was in my new years resolution though!